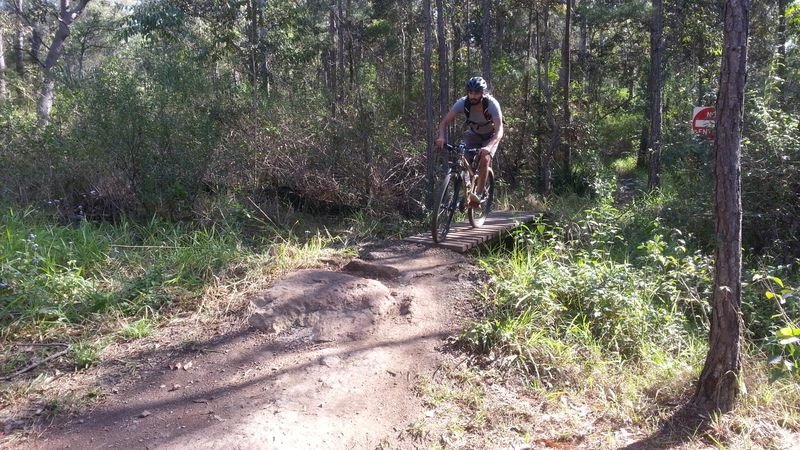 When one of the most passionate mountain bike riders in South East Queensland organises a ride, you don’t want to miss it. 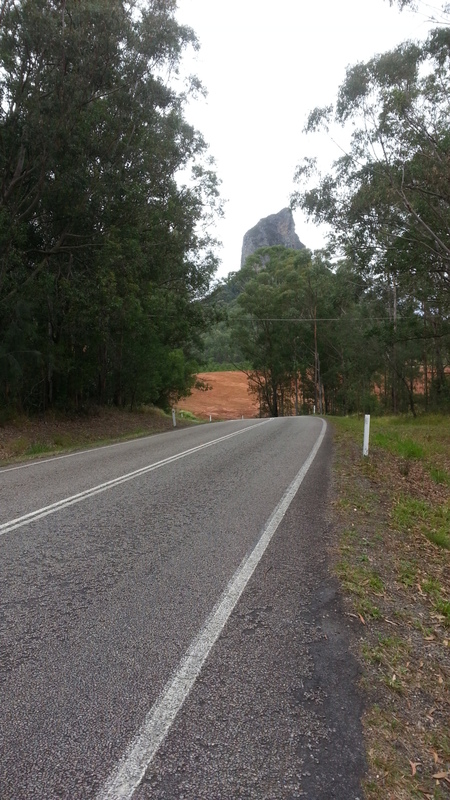 Neil Ennis and his good friends have spent countless hours designing the best possible route through the magnificent Glass House Mountains. Rising dramatically from the surrounding landscape of eucalyptus and pineapple plantations, the mystique of the Glass House Mountains makes them one of Australia’s most fascinating landmarks. 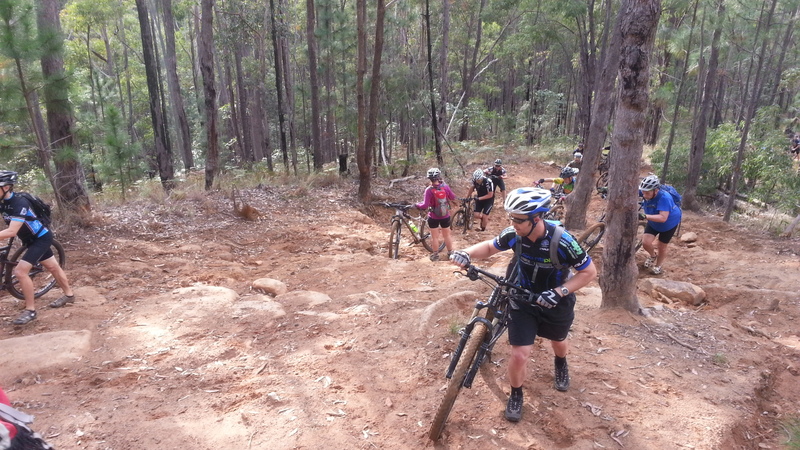 68 keen mountain bikers congregated at the Matthew Flinders Rest Area. 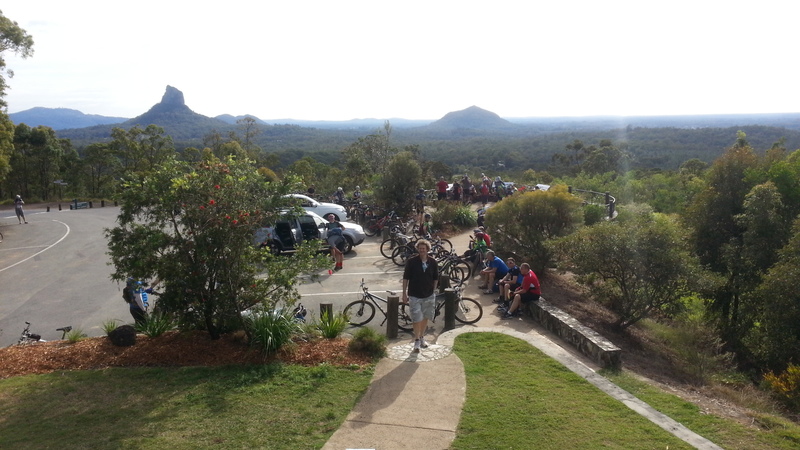 After a ride briefing from the man himself, Neil, we set off in the direction of the Glass House Mountains lookout. Although we had some rain overnight, the temperature was perfect and everyone was smiling. After leaving the tarmac we soon saw evidence of the fresh rain. 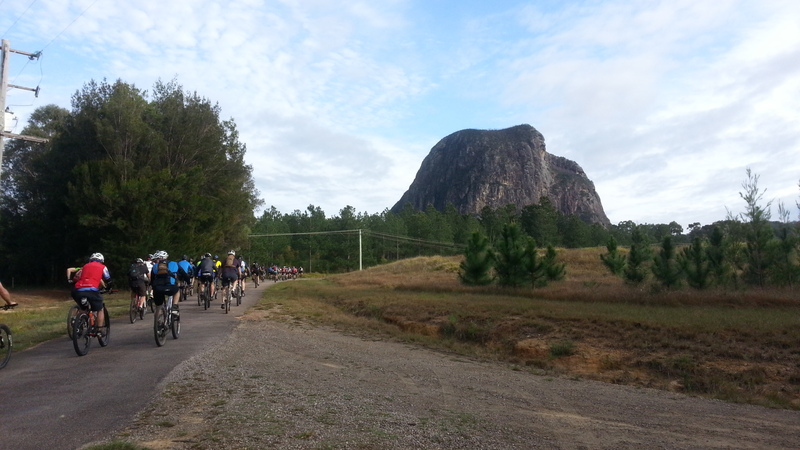 We soon re-grouped at an intersection and started to climb. 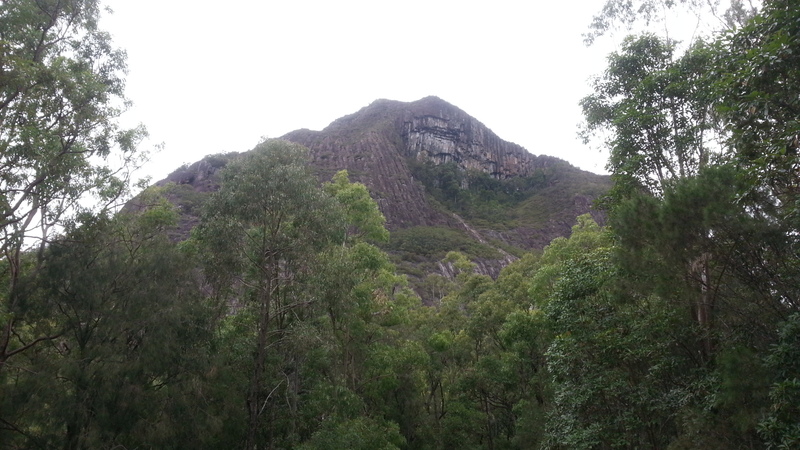 It was a nice gently climb except this one rocky section. 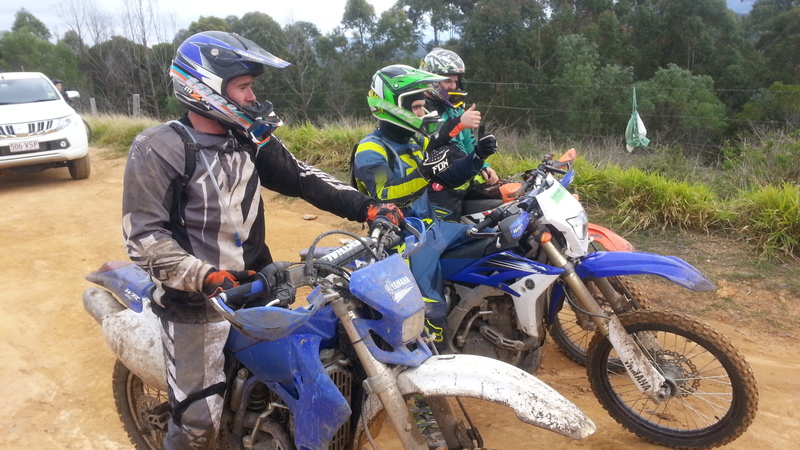 The more capable riders had a crack, putting on some entertainment and laughter could be heard amongst the group. 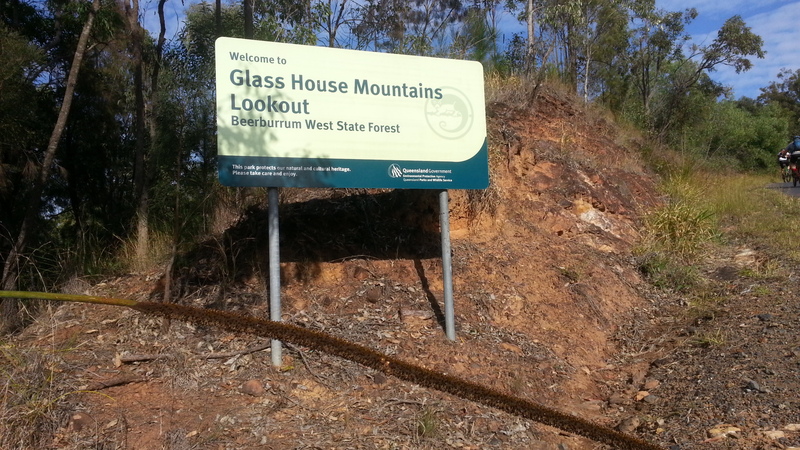 We soon hit Glass House-Woodford Road, that leads up the Glass House Mountains lookout. The view up there is just absolute magic and easily reached with any car. If you haven’t been there before, I highly recommend visiting. After a good rest, refuel and tweaking our bikes, we set off North along the gravel road heading down at first reaching some exhilarating speeds. 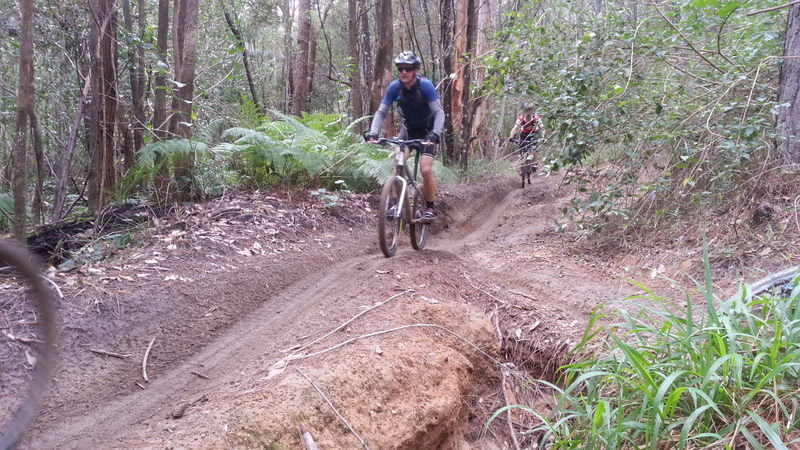 We soon reached the start of the Hennessey Hill downhill mountain bike track. 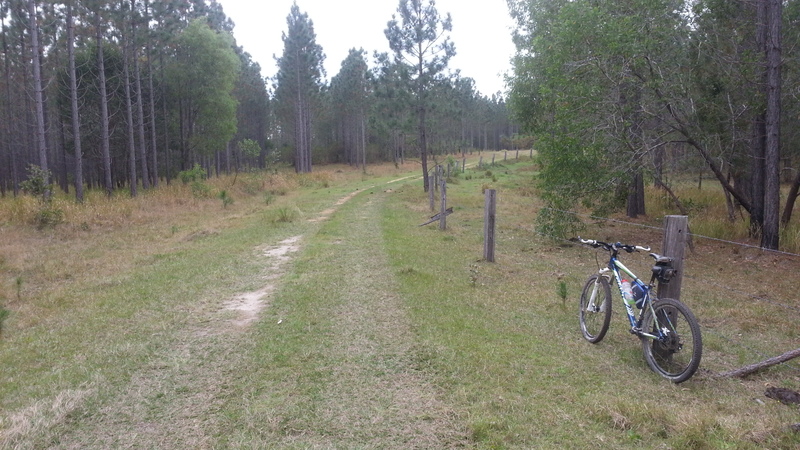 I had seen this track before while out on my dirt motorbike but of course stayed off it back then. Today was my turn to give it a crack! At the bottom we re-grouped. 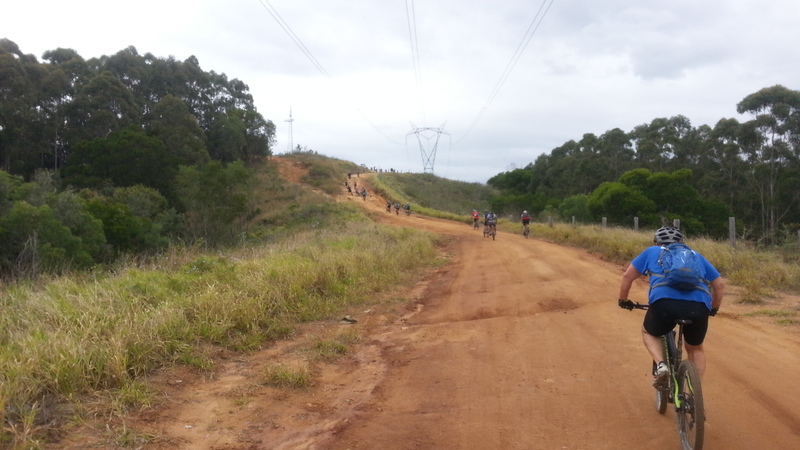 Some riders had so much fun, they powered back up the side road and descended the downhill track for a second time. 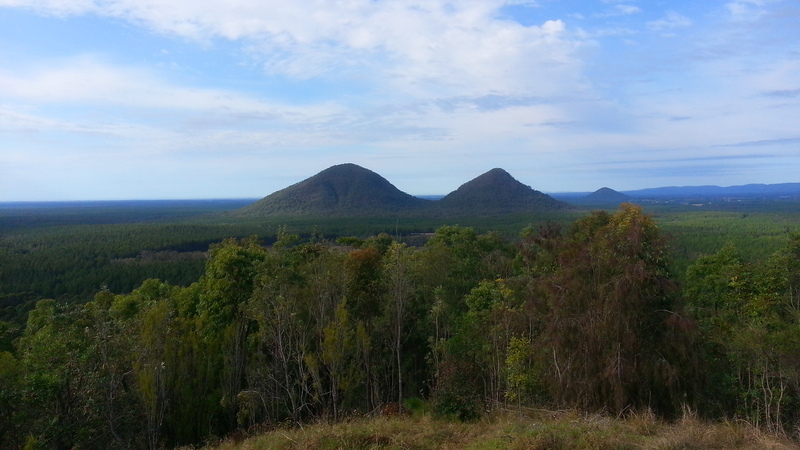 Yaa hoos could be heard echoing through the trees. 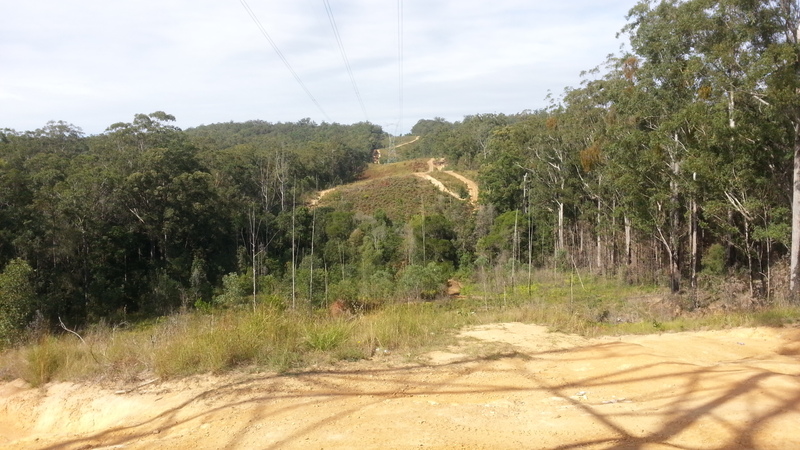 We then followed a 4×4 track through the lush eucalyptus. At times descending steep launching off water bars. As I approached the bottom I could hear commotion and laughter. 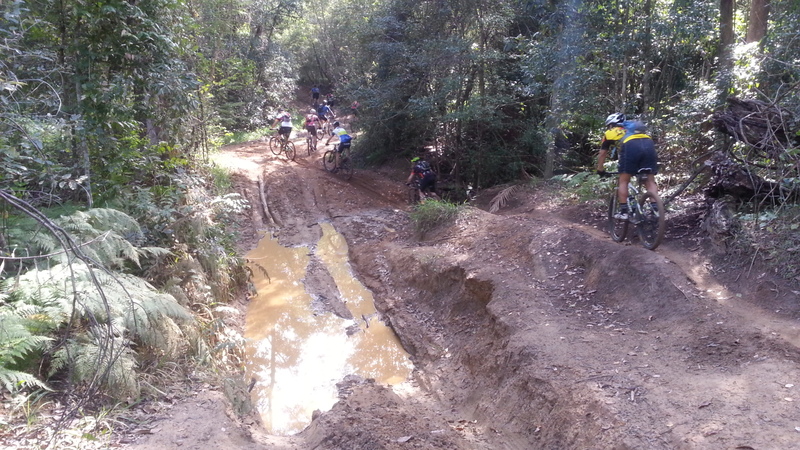 The deep mud hole delivered a fun challenge for the fat bike riders. For those that don’t know what a fat bike is, it’s a mountain bike with 4 to 5 inch wide tyres. They look like motorbikes with pedals! I believe they are superb for sand, mud and loose surfaces as the big fat tyres ride over the top. Around the corner was another interesting little section. 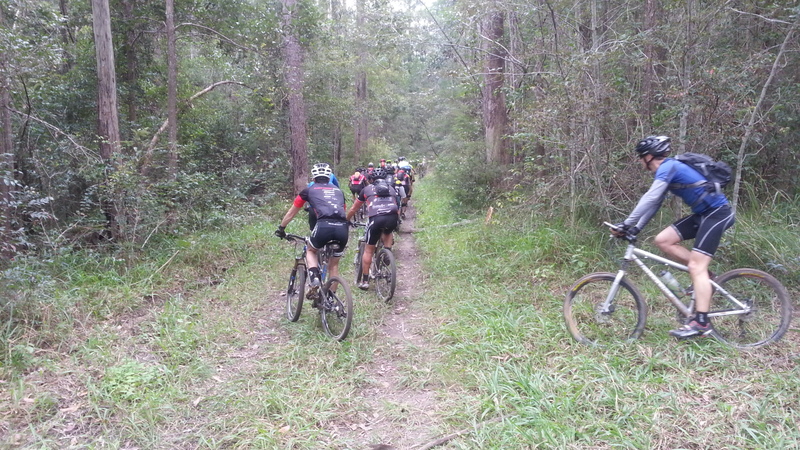 After a short climb we ended up on the powerline track where we re-grouped again. 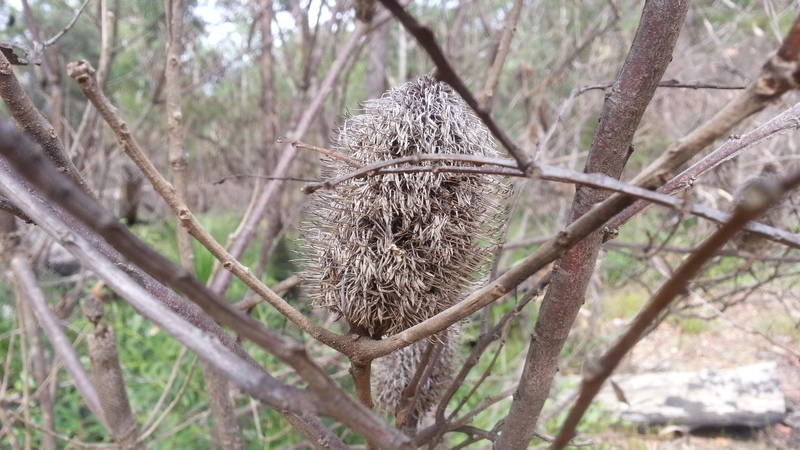 I spotted this interesting plant while taking in the surroundings. 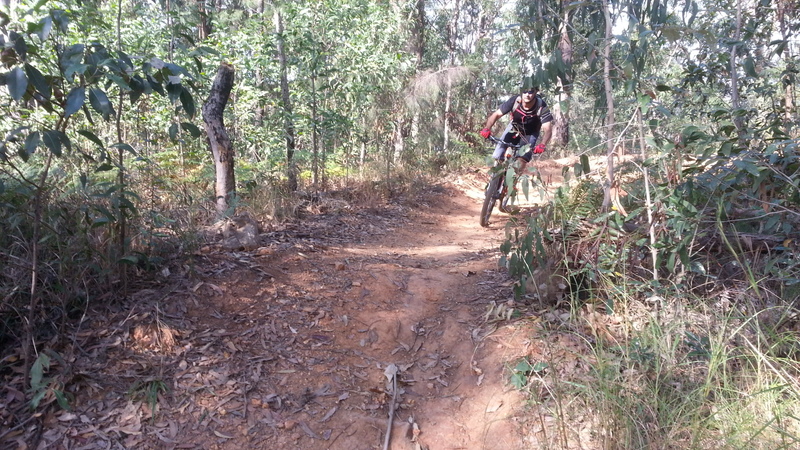 Next was a single track that carved through the pine trees. It was long and very enjoyable. After lots of 4×4 fire trails, it was a welcome surprise. Neil’s rides are never boring! 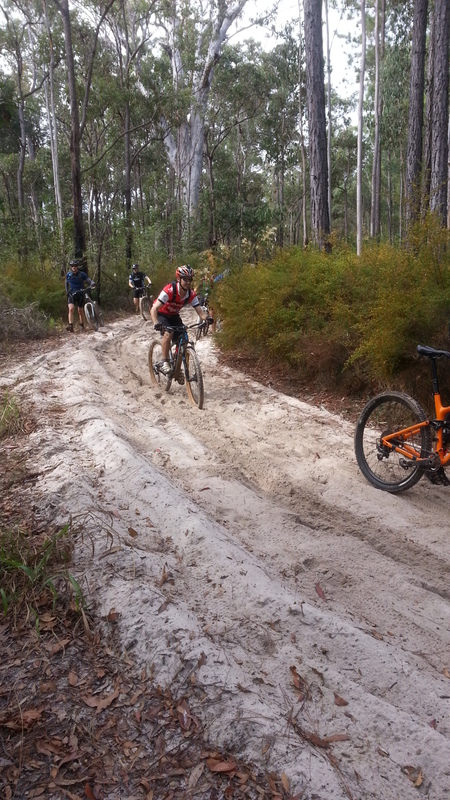 When we got back onto the fireroads the surface turned to sand, luckily only for short sections. I found the sand fun! Some of us powered through with the bike dancing around like a rodeo bull. It made for some entertaining dismounts! One time I fell, the sand was so soft I didn’t even bother getting the feet out of the cleats (clip in pedals), I just let my body land on the soft sand as I laughed off my damaged pride. 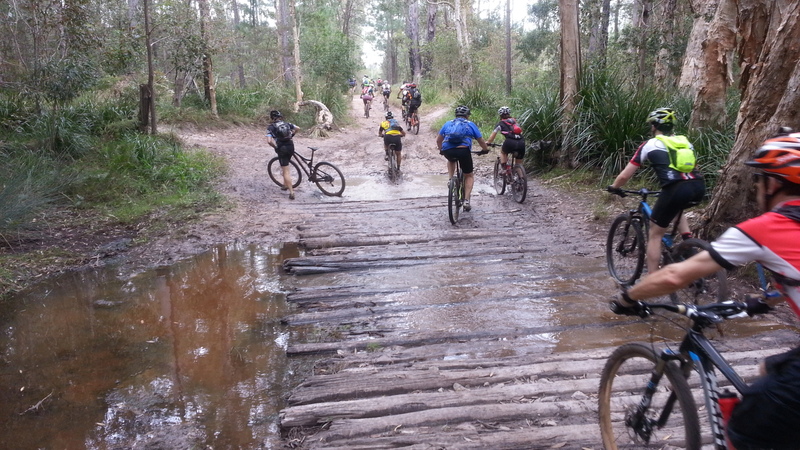 Next we came across an interesting creek crossing made from small diameter logs. 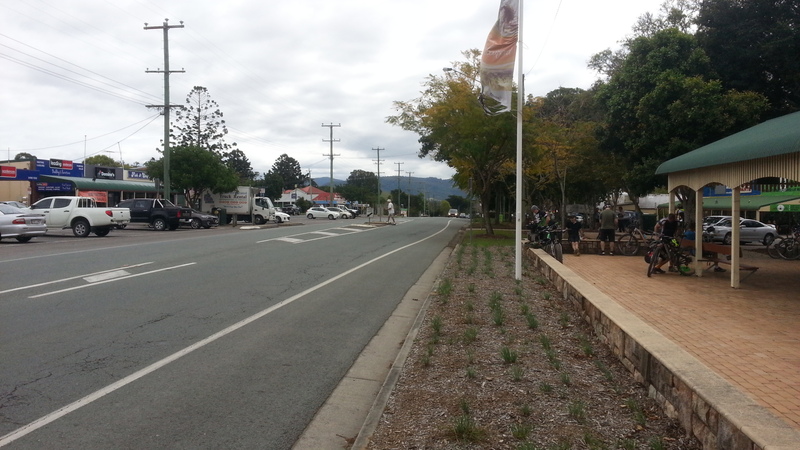 We soon arrived at Woodford for lunch. 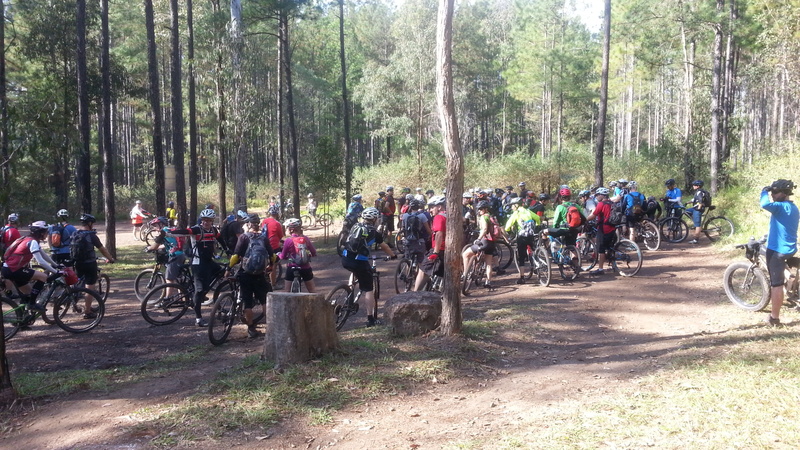 68 mountain bikers inendated the small town spreading out and devouring all the cafes and bakery. I chose subway with a small coke, boy did that go down good! Hardly touched the sides! This terrain was zapping my energy. 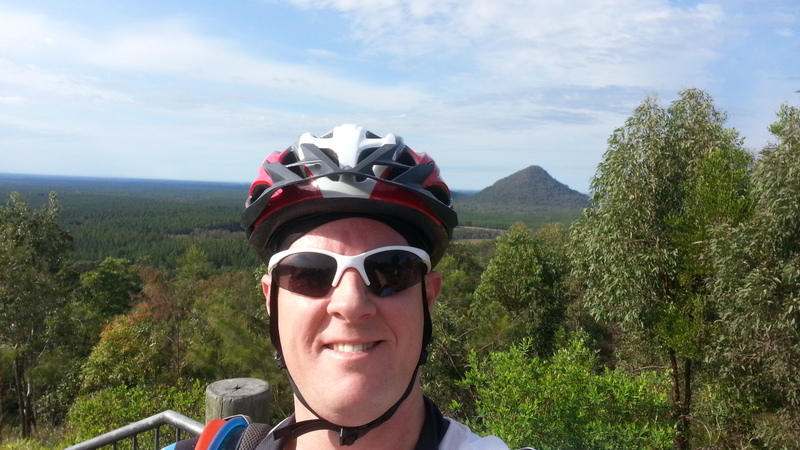 After a short bike path roll out of town we were back in the thick forest of Glass House Mountains National Park. Neil had found some beauties on his exploration rides in preparation. I loved this track. Thanks Neil!!! Time do a bit of climbing as the friendly motorbike riders waited for us at the top. 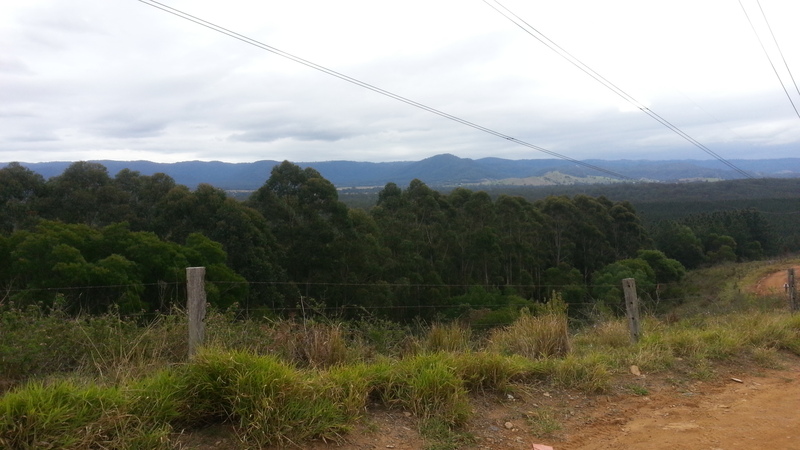 The views up here were pretty good! 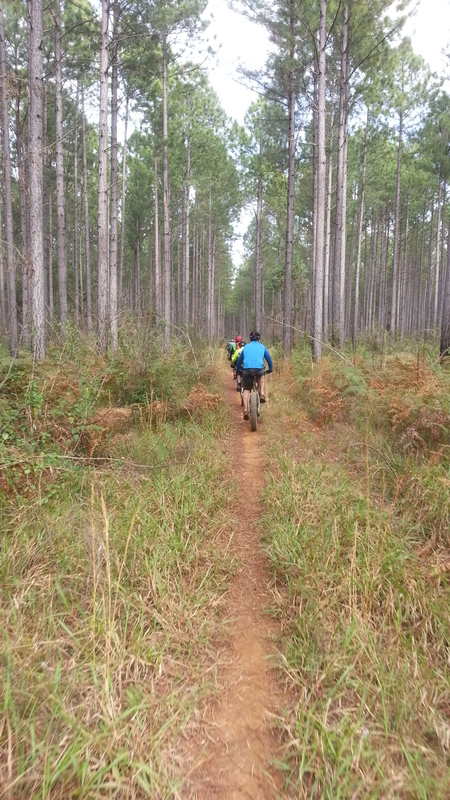 After a short downhill stint, the route had us on this motorbike single track, it was so fun as we continually winded through the bush on smooth berms and smooth humps. At times you could pump the bike instead of pedalling and actually gain speed! Awesome! 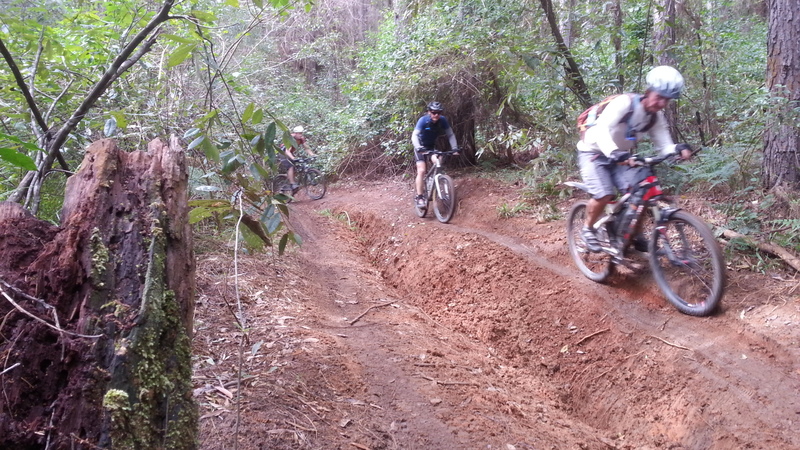 (for those interested, google ‘push bike pump track’). Some of the sights of this great region kept appearing through the trees showing it’s wizardry! 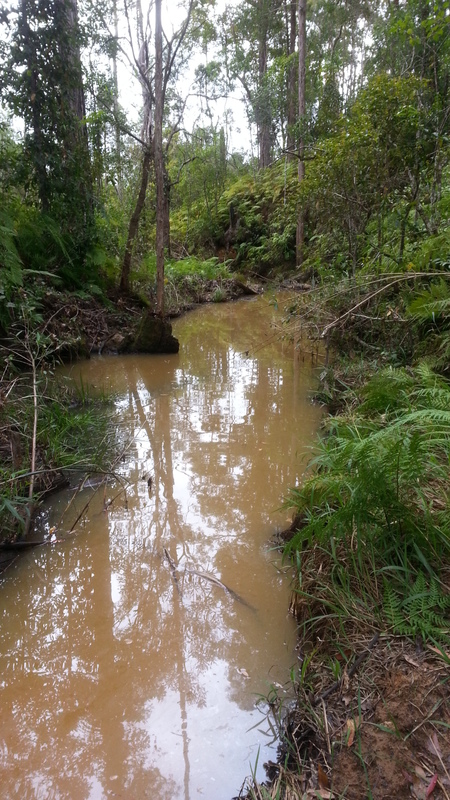 I particulary admired this creek. After several hours the ride was getting close to finishing. 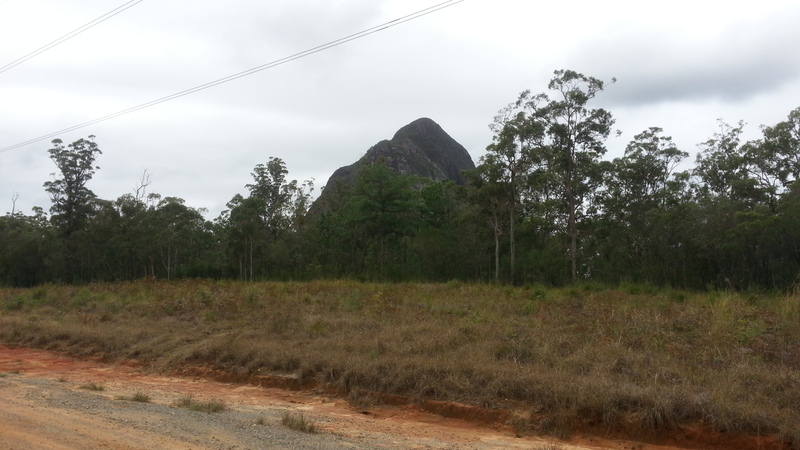 We hit this road with roughly 10 kilometres to go. The fast guys/girls quickly formed a peleton and it was on! 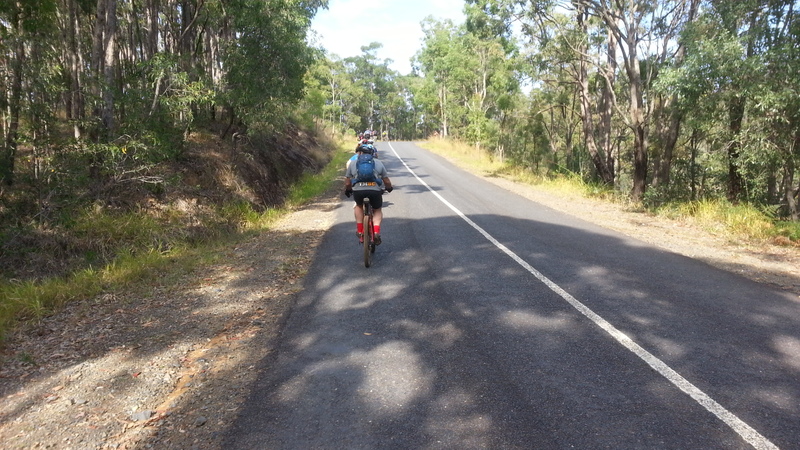 I tucked in behind Rebecca Stone, a very fast tough efficient rider, some refer to her as a mountain goat. Even carrying a little girl in her tummy, she had no problem glued to the peleton. I managed to stay on for about 5 kilometres before my legs blew up with lactic acid, dropping off and cruising the rest. 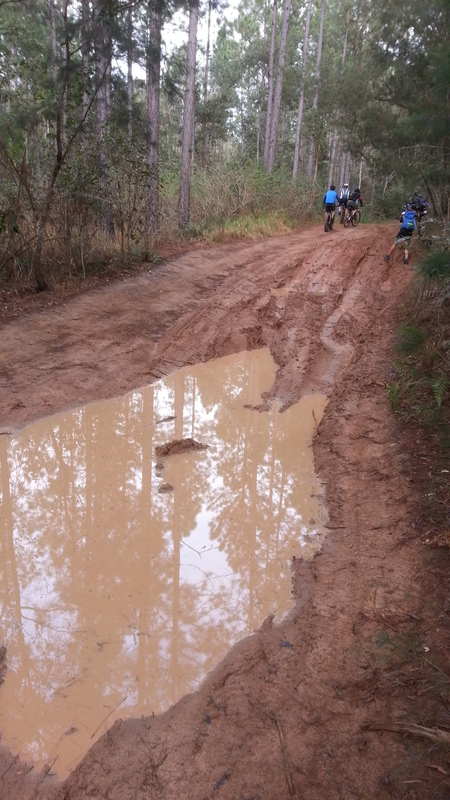 Considering we had done 60 kilometres in tough terrain, the pace was extraordinarily fast! 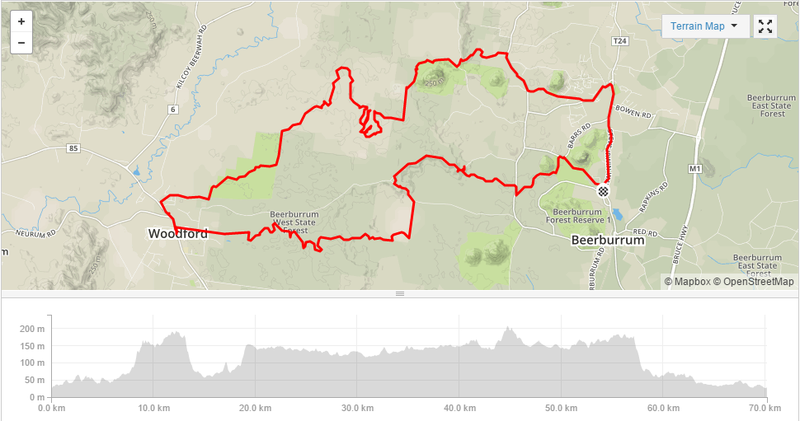 Thanks again to Neil Ennis, Eric Dousi, Rebecca Stone, Darb, Paul and Mike who spent lots of their time mapping out this ride and making it so good for the rest of us. Legends. Distance: 70.2 kilometres; Elevation gain: 800m; Total time: 7 hrs 44 mins; Moving time: 5 hours; Average speed: 14.1 Km/h; Calories spent; 2,705! Due to the sand, mud and my drivetrain always gritty, I will rate this ride 8.5 out of 10 on the tough-o-meter. Great stuff Adam. 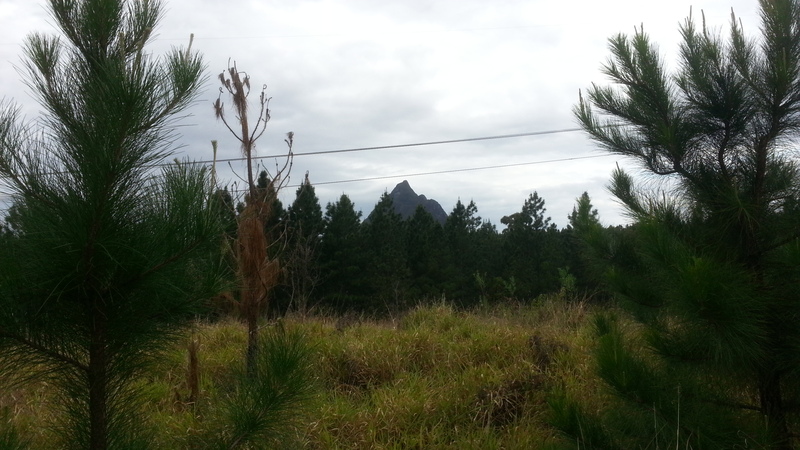 I remember riding there through the pine plantation one very rainy day. 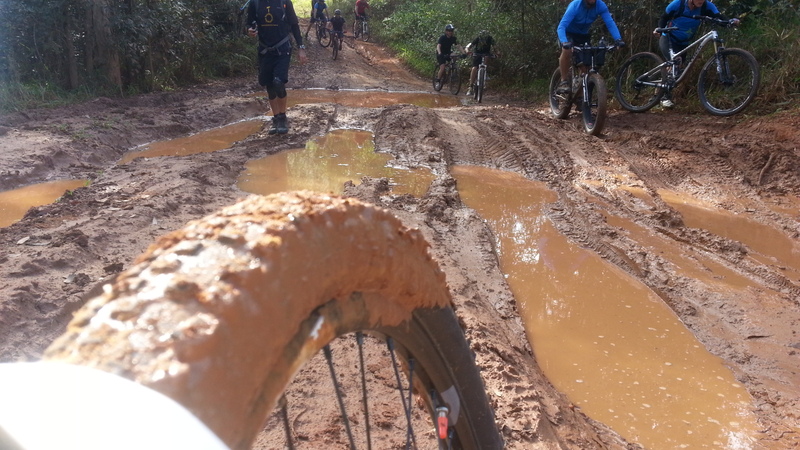 The mud was so bad it clogged our gears and kept derailing the chain. Ask you mum if she remembers that ride.